Red-Spotted Newt (Notophthalmus v. viridescens). Photo: John White. ANNAPOLIS, MD (November 01, 2016) – Chytrid fungus (Batrachochytrium dendrobatidis or Bd), has been called the greatest threat to global amphibian biodiversity, having caused the disappearance of more than 200 of the world's frog species since the 1970s. Now there's a frightening "new kid on the block" called BSal, short for Batrachochytrium salamandrivorans, a close cousin to Bd, that is exclusive to salamanders and newts. First discovered in 2013 in the Netherlands in wild European fire salamanders (Salamandra salamandra), BSal likely originated in Asia and spread through the global pet trade. Since 2013 it has also been found in wild and captive salamanders in Belgium, Germany and the UK. Given that the U.S. imported over 28 million salamanders in a six-year period in the past decade, the potential for introduction to North America is high. This is especially bad news because North America harbors over 50% of the world's salamander species; the southern Appalachians, with 141 species, are the recognized global biodiversity hotspot. As amphibians become less active in preparation for the coming winter, the Maryland Invasive Species Council has chosen BSal as its November Invader of the Month. Both Bd and BSal are chytrid fungi with aquatic zoospores that infect the skins of their victims. Amphibian skin is a vital organ, performing critical functions such as balancing fluids, exchanging gases, keeping electrolytes in homeostasis, and providing a protective barrier against pathogens. Whereas Bdcauses mainly abnormal overgrowth of new cells and thickening of the skin, BSal causes skin ulcerations, with significant destruction of the epidermis. BSalis spread through direct contact and exposure to contaminated water and soil. Clinical signs of BSal in animals include excessive skin shedding, lethargy, anorexia, abnormal posture, and death — the last occurring within two to three weeks of exposure. 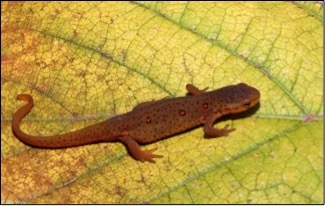 Susceptibility varies with species and developmental stage but newts (family Salamandridae) and lungless salamanders (family Plethodontidae) are especially vulnerable. Lungless salamanders account for most of the unique species richness of the southern Appalachians, with many species found nowhere else in the world. In Maryland, which has 23 salamander species, the red-spotted newt (Notophthalmus v. viridescens), 14 Plethodontid salamander species and one or more siren species are at risk — a significant portion of our salamander biodiversity. Researchers have found that colonization of BSal occurs at temperatures of 15°C and 20°C but not at 25°C. BSal is two times faster at causing infection buildup and the earlier mortality linked with it at the lower temperatures, e.g., 15°C. The good news is that this has led to promising heat therapy: infected animals that were held at 25°C for 10 days had complete clearance of the infection and were clinically cured. Researchers have also found that topical treatment of BSal-infected animals with certain antibiotic and antifungal medications in heated conditions resulted in clearance of the infection. Applying these potential cures to infected wild populations will be a challenge, so the best cure is to prevent introduction of this devastating fungus to North America. The U.S. Fish and Wildlife Service has notably heeded the pleas of scientists, and effective January 28, 2016, banned the importation and interstate commerce of 201 salamander species as injurious wildlife under authority of the Lacey Act, including most species found in Maryland. Permits can be issued for exceptions to this rule, but these are primarily for researchers. At the same time USGS and other partners began a disease surveillance of wild salamanders throughout North America, especially focusing on those in the Appalachians. So far none of the more than 10,000 animals sampled has tested positive for BSal, though many have been positive for Bd. Maryland samples, mostly of red-spotted newts and Eastern red-backed salamanders (Plethodon cinereus), have all been negative for BSal. Next up is testing of pet salamanders, which could be much harder to accomplish given the past levels of importation and trade, and differing willingness of owners to cooperate with scientists. You can help by following strict decontamination protocols when conducting fieldwork or enjoying time in wetland habitats, see the protocol here — and by reporting any sick or recently deceased salamanders to Maryland DNR. Grant, E.H.C., et al. 2016, Salamander chytrid fungus (Batrachochytrium salamandrivorans) in the United States — Developing research, monitoring, and management strategies: U.S. Geological Survey Open-File Report 2015-1233, 16 p.
Martel, A., et al. 2013. Batrachochytrium salamandrivorans sp. nov. causes chytridiomicosis in amphibians. Proceedings of the National Academy of Sciences 110:15325-15329. Martel, A., et al. 2014. Recent introduction of a chytrid fungus endangers Western Palearctic salamanders. Science 346:630-631. Yap, T.A., et al. 2015. Averting a North American biodiversity crisis. Science 349:481-482.